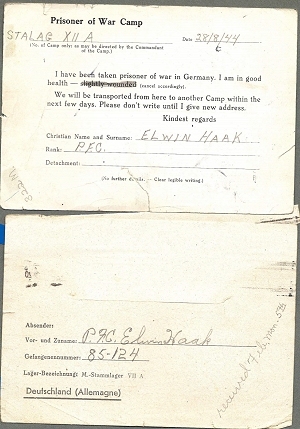 Elwin H. Haak died on September 14, 2012. 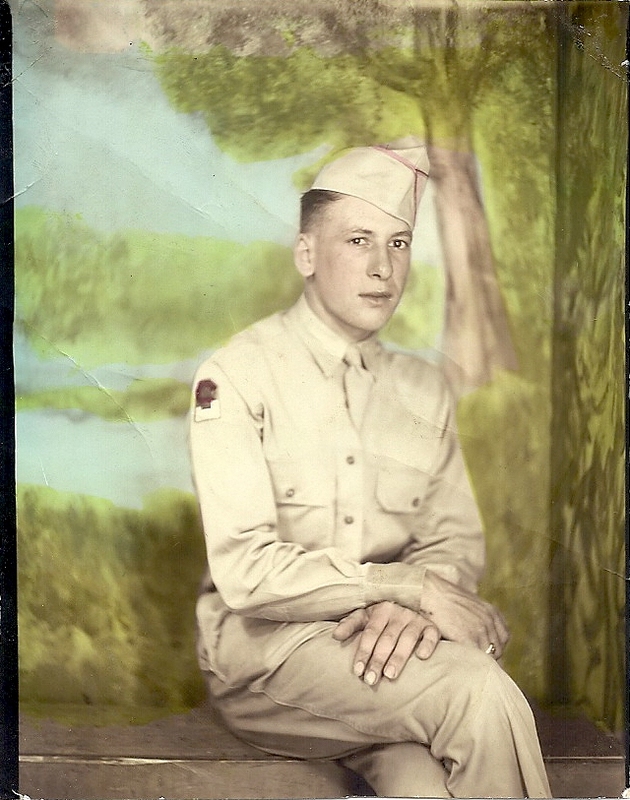 He was in WW2 in the U.S. 298th Engineer Combat Battalion. He was captured by the Germans in France on August 7, 1944 and taken to Moosburg, Stalag VII A. Below is his war story that he told to his daughter, Dawn Haak Rosendall in 1995. I was drafted into the war in 1943. I was trained as a combat Engineer. An engineer's job was to build emergency bridges for our troops, lay landmines, and destroy enemy bridges. I was suppose to land at Normandy in France to blow up German gun placements, but two weeks before this invasion my Commander asked if anyone could ride a motorcycle. I knew how to ride, so my job was now to follow convoys on motorcycle and messenger information from the front of the line of troops to the back and vice versa. Just outside Martain France, on a very foggy night I was riding up to the command car when I noticed troops in a ditch. At first I thought they were our forces, but I soon learned that this was not so. A German car was heading straight for us firing tracer bullets to light up the area. Firing broke out and I headed for the opposite ditch. The Germans outnumbered us (it was a whole Panzer division) and everyone was scattering. To get out of the way of the range of fire, I crawled under a German command car. When everything quieted down, the car began to move. I held on under the car with the intention of dropping off a little way down the road. Just when I let go, the car turned a corner running over my foot. 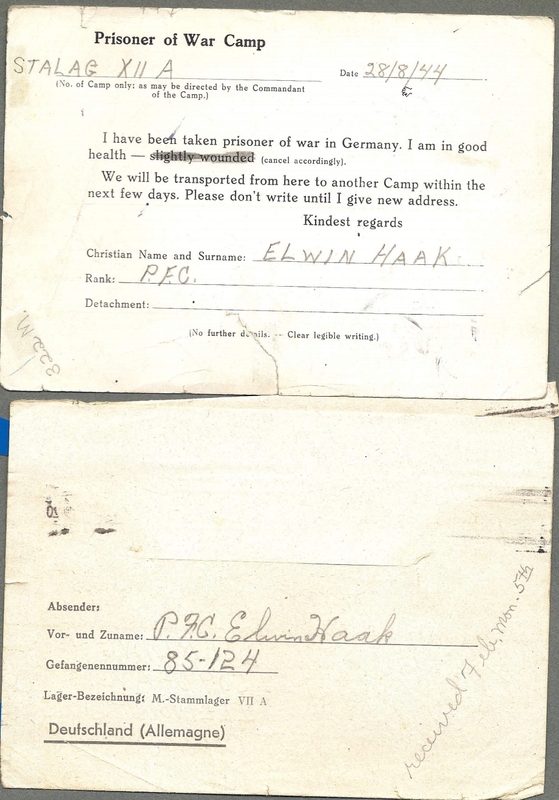 I was taken prisoner along with several others on August 7th, 1944. We were driven to a farm when it was light and locked in a barn. We were moved by train everyday over a two week period. One time, right after being taken off a train, it was destroyed by our own forces. I eventually wound up in Germany outside Munich where I was to make repairs on the railroad tracks. Then in October, I and fourteen other prisoners were moved to Beutelsbach, Germany where I was assigned to dig potatoes and sugar beets on the farm of Josef Pichlmaier, his wife, and fifteen year old son. There were also two Polish people living and working there under forced labor. I was allowed to walk to and from the farm on my own, but at night was guarded in a communal sleeping area. The farmer and his family were very kind to me and fed me very well. In April of 1945 while working in the fields, guards came and said that I and the rest of the prisoners had to leave. We were marched all night, and there was lots of German troop movement and gunfire. The German guards, after being with us so long became protective of us and feared for our safety because many of the troops were killing prisoners they happened upon. They let some of us run off and said to go back toward Neukirchen (unsure of spelling) because there were U.S. troops in the area. We walked back toward Neukirchen and ran into a U.S. armored division. The division went and picked up the rest of the prisoners. I was flown into Reims, France the day after the Armistice was signed, and four days later was shipped back to the states. In 1973 I took a trip through Europe. In Germany, I located the farm of Joseph Pichlmaier where I had worked during my time of captivity. I was surprised and delighted to learn that his son was still farming the land. We both recognized each other immediately, and through lots of gestures was able to communicate about that time many years ago. We still exchange yearly Christmas letters. Last update 2-11-2012 by © Team Moosburg Online (E-Mail) - All rights reserved!